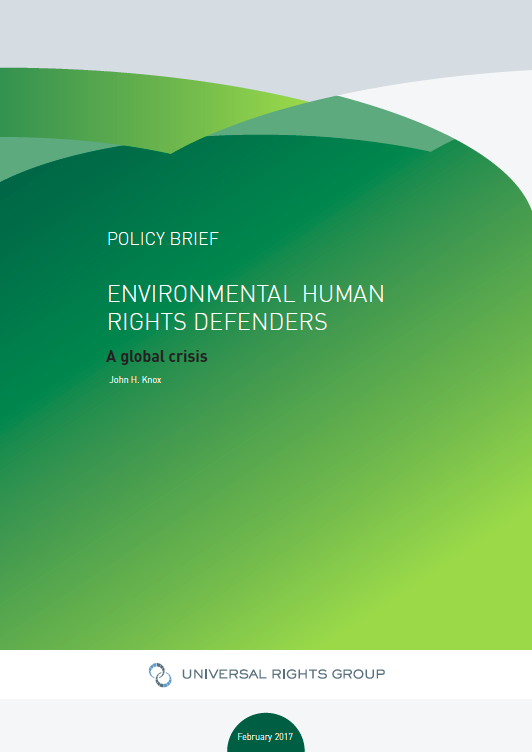 While many aspects of the relationship between human rights and the environment are important, none is more urgent than the need to protect those individuals who work, often at great personal risk, to protect their natural environment from unsustainable exploitation, and defend the human rights of themselves and their communities. Without these dedicated individuals, the protection of the environment and of the rights that depend upon it would be impossible. Reporting from the front line of environmental protection around the world, the threats facing EHRDs are perilous and increasing. Less than three years ago, Global Witness conducted the first comprehensive review of the number of killings of EHRDs around the world. Going back to the beginning of 2002, and covering cases through to the end of 2013, it found that at least 908 people had been killed as a result of protecting their rights to land and the environment. More than 90% of recorded deaths occurred in only nine countries. Shocking as these numbers may be, they are, in themselves, an inadequate means of conveying the scale and nature of the challenges and risks faced by EHRDs. For one thing, data on the number of killings tells us nothing about the myriad other human rights violations suffered by EHRDs. Killings may be ‘the most acute and measurable end of a range of threats’ to EHRDs, but for every EHRD murdered, many more, in every region of the world, are subjected to other types of violence or harassment, designed to instil fear and prevent activism. Most importantly, behind the above-mentioned statistics, behind each of those numbers, is a face – a person killed merely for trying to assert their rights and protect their environment, and a person whose loss continues to be felt by their family, their community and their cause. Understand the contemporary situation of EHRDs around the world. Understand why human rights violations against EHRDs appear to be on the increase in all parts of the world, and especially in Latin America and Asia. Explain why the work of EHRDs is so vital – for the planet, for local communities, including indigenous communities, and for sustainable development. Present some of the inspiring stories of EHRDs who have sought to assert their human rights to defend the environment, including those who have paid the ultimate price for their bravery and dedication. Assess current international efforts, led by the United Nations, to support EHRDs and their work. Present recommendations, to all stakeholders, as to how the Human Rights Council, its mechanisms, and the wider international community can better protect and promote the rights of EHRDs, and ‘defend the defenders’ so that they can continue their vital work. URG, Global Witness, N1M and other NGOs, in collaboration with the UN Special Rapporteur on human rights and environment, have come together to begin the development of such a portal. When completed, this new resource will be available at the following web address: www.environment-rights.org.